The Russian Defense Ministry on Friday denied claims by Ukraine’s Defense Minister Valeriy Heletei that Russia has allegedly delivered arms to eastern Ukraine. Some 90 percent of equipment and materials used by Russia's largest arms manufacturer, Machine Engineering Technologies, is domestically produced, the company's CEO Sergei Rusakov said on Tuesday. Lebanon is engaged in talks with Russia to buy weaponry and special equipment for the country, Lebanese Interior and Municipalities Minister Nouhad Machnouk told International Information Agency Rossiya Segodnya. Russian President Vladimir Putin will hold a meeting on Wednesday on a draft state armaments program for the 2016-2025 period, the press service of the Kremlin reported. Britain is going to transport arms to Kurds, fighting against Islamic State insurgents, as radicals lay siege to the Kurdish capital Arbil in northern Iraq, according to Associated Press. The United States has launched direct arms deliveries to Kurdish forces in Iraq fighting against Islamic State (IS) militants, The Associated Press reported Monday, citing senior US officials. The United Kingdom is planning to review its $13.4 billion in arms and military goods exports to Israel, according to a spokesmen for the prime minister. Britain is to supply £132 million ($225 million) worth of arms to Russia despite the call for new sanctions, BBC News said Wednesday, quoting the report by the cross-party Commons arms export control committees released earlier today. A local man was detained in western Russia for putting up for sale six mortar bombs, police in the Russian exclave of Kaliningrad said. 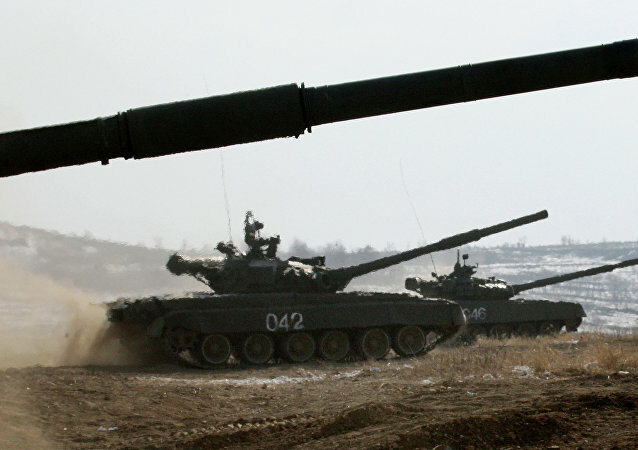 An international arms exhibition in the Russian city of Omsk closes Friday, October 4. This image gallery shows some of its highlights. A hybrid combat vehicle that combines features of an airborne infantry fighting vehicle and a helicopter will be developed for the Russian Airborne Forces (VDV) by 2030 to meet the demands of modern warfare, the military branch’s commander said Thursday. Russia’s arms disposal program has failed to meet any of its declared goals in the past two years, the government’s financial controller said Wednesday. What do these three things have in common: tanks, abortions and instant coffee? They are all things that Russia exports, performs or consumes more than any other nation. Police in the Russian city of Krasnoyarsk have confiscated live ammunition from a woman who was storing military projectiles in her garden, a local Interior Ministry spokesman said on Wednesday. The Russian Defense Ministry has signed 737 billion rubles (about $22.5 billion) worth of contracts as part of its arms procurement program for 2013, a senior ministry official said on Monday. The former CEO of small-arms manufacturer Izhevsk Mechanical Works (Izhmash) has been charged with a 35 million-ruble ($1.1 million) fraud, Moscow police said on Thursday, in the latest of a string of corruption scandals to hit the Russian defense industry. Russia’s state arms exporter Rosoboronexport is planning to complete the deliveries of weaponry under existing contracts with Venezuela by the end of 2013, the head of the company’s regional department, Sergei Ladygin, said on Tuesday. Russia’s global arms exports reached $15.2 billion in 2012, a 12 percent increase against the previous year, Russian President Vladimir Putin said Wednesday. Russia should offer loans more often to help finance its global arms exports, but should lend money on the basis of market conditions and not ideology, President Vladimir Putin said on Wednesday.